DeepFocus is a simple yet elegant Wordpress Photography Theme designed to help you create a Portfolio website. You can use this theme to create a Wedding Photography website, business Portfolio website, photo gallery, website like flickr and so much more. DeepFocus Wordpress Theme features a front page image slider, full width option, password protected galleries, unlimited image galleries and much more. 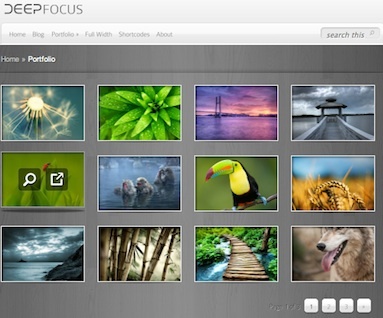 Click here to see more features of Deep Focus. 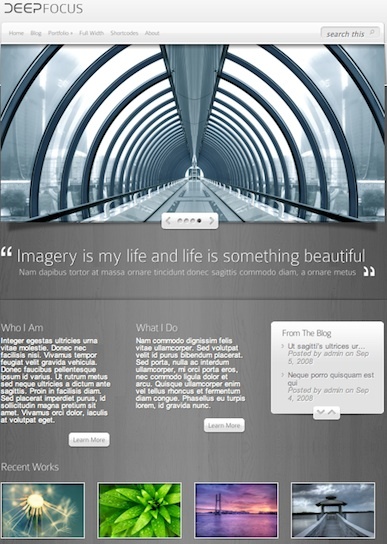 ElegantThemes provides elegant WordPress Themes. Their membership fee includes unlimited 1 year access to download any of their themes and theme updates. They currently have over 74 themes and 2-3 themes added every month.